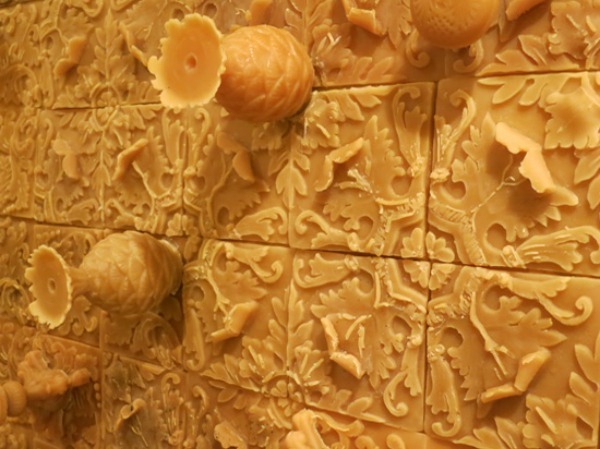 Montreal-born Penelope Stewart has transformed yet another room – this time in a California gallery – with her extraordinary architecture, covering the walls with succulents, baroque tiles and lotus pods all cast from beeswax. The installation is part of a tribute to bees in a new exhibition called Swarm, at Ganna Walska Lotusland, a public estate and gardens in Santa Barbara, where Stewart is artist in residence. 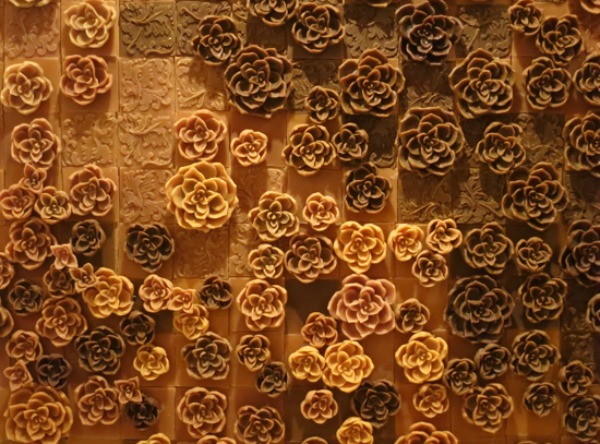 Stewart has a multi-disciplinary practice comprising installation, sculpture, photography and works on paper. But it is her unique sensory architecture that has brought her particular prominence in Canada, the U.S., Australia, France, Italy and other countries in the last few years. (Above /Below: Apian Screen II, (solo) at the Musée d’Art de Joliette, Québec) See a great post on the emergence of her work on Edible Geography, here. Stewart has a number of fascinating blog posts here about her prep and installation for the exhibit in California. 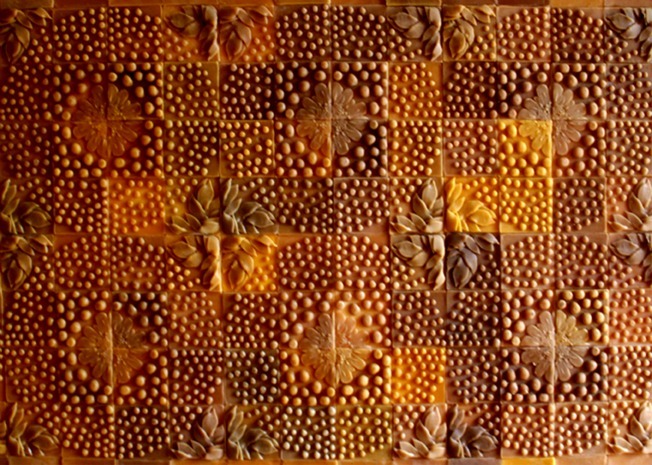 Below, tiles from a variety of her work. See her website, here. Exquisite! Thanks for introducing her work here. Absolutely marvelous, the way she includes all of the senses in such beautiful art. xoxo! Very glad you enjoyed – true about all the senses, complete envelopment. the smell & the sound. the full room installation must absorb sound differently. intricate & gorgeous in their tones. Hey Michelle – I didn’t think about the sound, great point. I’m with you on the tones. There’s a bit of info on her blog (progress shots) about the differing hues, which are fascinating. This artwork is absolutely incredible! To see it in person must be amazing. Thanks for delivering these gorgeous works, every week without fail, and making our lives richer! I love that there are so many stimulating Canadian artists out there (sadly, so many of them not working in this country) and that there are folks like you and other followers so taken with their work. Thank you! This is wonderful! I have seen some very interesting and exciting art on this site. I am never disappointed. Thank you Boomer! You’re one of the most appreciative and appreciated followers i have!! You’re welcome. You’re so welcome – and just drop by when you’re able! Again, amazing what artists think up! I wonder how malleable that stuff really is and if it can be melted down and reused once the installation is over? It seems people were allowed to touch it by looking at the photos here and on the other site. The colors are so warm and welcoming. Like Micah said, I want to smell it! Great comment about the malleability. I think it’s pretty malleable, but I don’t know about re-use. Her blog process shots show a lot of handling even before it becomes tiles or extruded objects, so it must be pretty strong. The scale of this project makes it so full of impact. Honestly though, I would love to smell the installation almost as much as I would like to see it. Yes, I was stunned by the power of this technique, especially the huge walls. You know, she mentions the smell and so do a lot of the critics. I think that might be part of the appeal. Nia – I agree it’s amazing. And thanks for the re-blog. Great word for it – lovely.